Like many of you I imagine, I was not too interested in the Black Friday sales, the only thing I really needed was hosting for my new site, and I enjoyed Hostgator’s 75% sale (still active today, at 60% and flash sales at 75%, click here to check it out) and I bought it in the wee hours of the morning on Friday and called it a day. But out of curiosity, I also wanted to check on a super thin laptop on Amazon. 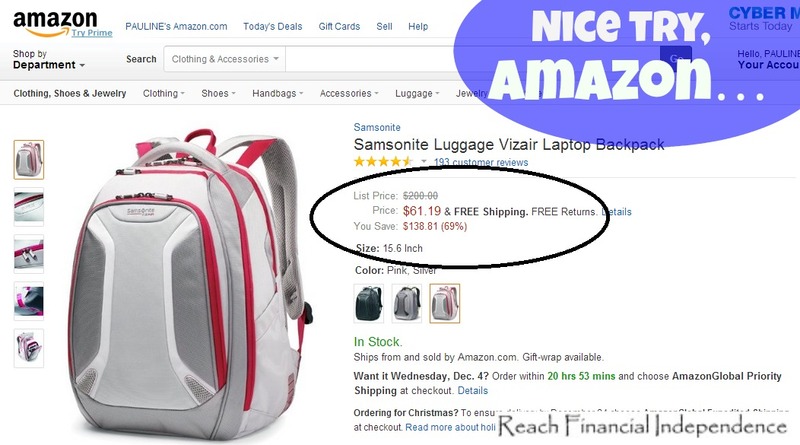 Black Friday deals didn’t include the laptop I liked, but Amazon, in its ever brilliant way to get you to click on other stuff, had a 70% sale on laptop backpacks. 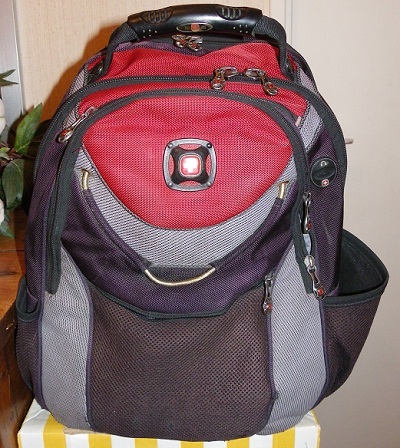 I have a backpack that I love from Swissgear, it is sturdy, and red, my favorite color, and it has all those padded pockets for your mp3 player, your laptop… but it is a bit bulky and the handles are getting really worn by the heavy wear for the past 5+ years. That backpack went on 18 months of motorcycle trips, where it was used daily, plus countless other small trips, as it fits perfectly as a carry on and you can stuff it with a week’s worth of clothes and things if you are a light packer. So my curiosity was piqued by such a big discount, and I saw that lovely model by Samsonite. WOW, discounted from $200!! I would save 69% according to Amazon! Where is my credit card? Thankfully, there was just a minor glitch in the plan. Where to send it? 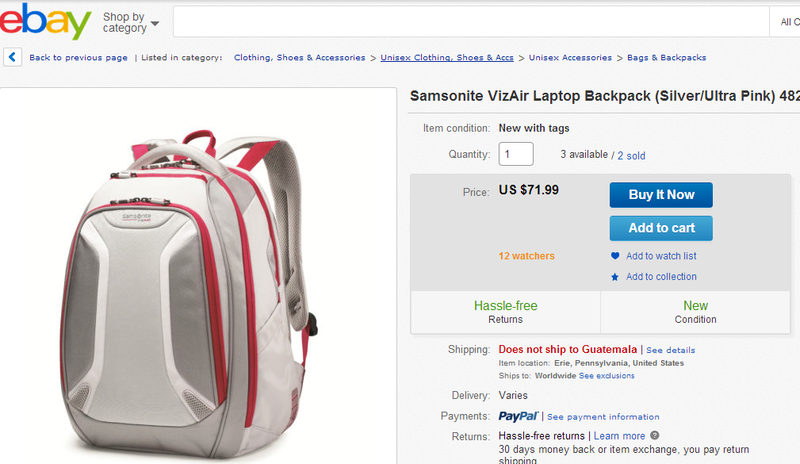 Guatemala would charge crazy taxes on a new item, shipping would be almost the price of the bag, and custom would double it. I could send it to the US, as we are going in February, and ask a nice person to keep it for me for a couple of months. Or…. what if I checked around to see what the regular price of the item really is? Oh, hello, Ebay. I’ve heard a few things about you. No Black Friday sales? That is too bad. Low prices all year round? Let’s have a look. $10 more for my backpack, not $138.81. It can wait until February, if I still want it by then. And they will accept Paypal, so my online income will cover the expense. Or I’ll just go to the village’s sewing lady and have the handles sewn back with heavy duty strings for $3. Sorry, 69% discount, I won’t fall for it. Nice try, Amazon. Did you really save money on Black Friday? This post was featured on the Festival of Frugality, Yakezie Carnival, Financial Carnival of Young Adults, thank you! If you got desperate I would hold your back pack for you and then send to somewhere you would be staying in the US. Hell the backpack (from Amazon) probably ships from one of the four fulfillment centers in my state (three are with-in a 30 minute drive from my house which is probably why it makes me so mad something takes a week to get to my door). You are a doll Brian, did you see the little airplanes Amazon is testing to deliver in 30 minutes? Maybe you end up in the radius for same day delivery! I find it confusing sometimes to understand if Amazon is shipping or one of the resellers, who will take more time to do so. I’m glad you resisted! The best savings are the money you did not spend! Haha “too good to be true” sales. There was a furniture company in Canada that was taken to court over some of their advertisements, because at no point during the year did the furniture go to the “full retail price”… it was always on some sort of crazy sale. Benchmarking is an often neglected step in purchasing due diligence. Suppliers are all to aware of the anchoring effect and how the initial price and a subsequent discount really does make you feel like you’re getting a deal. Well done, and way to cover all your bases as a buyer. As far as I can tell pretty much everything on Amazon is always “on sale” to some extent all day every day- it makes it hard to tell when you are truly getting a good price or not, so you have to check other sites to find out, just like you did! It’s funny – even my son has started to realize that things for sale on the computer don’t really cost what you think they do until you check the shipping / taxes. I’d imagine that in Guatemala that there are probably some limiting circumstances on what and where you can order from. Speaking of Amazon: Did anyone else read about those “drones” Amazon was testing to deliver packages quicker to customers? MMD @ My Money Design recently posted..Niche Website Update 12 – Getting Click-Bombed and Over $600 of Passive Income! Depending on the seller, you can get shipping abroad or not, for a reasonable cost or not. I generally try to ship free in the US and have a friend ship to Guatemala as a gift/used item. I just saw that 30 min delivery, that is crazy but I guess we are all spoiled kids who can’t wait to get their toys delivered. Living in the jungle has put that into perspective, now waiting 3 months for something rather important is considered short! My goodness the cyber monday deals took over my inbox today! I just didn’t even click any of the links to avoid any temptation. There is nothing I really NEED! Where in the US are you going in Feb? Wow, good find! And a good reminder to the rest of us that sometimes a sale isn’t really much of a sale at all. Good catch. I always remind myself that if it was too good of a deal, amazon (or whatever retailer it might be) wouldn’t offer it as they wouldn’t be making any money. They are just tapping into our emotion of “Can’t pass up that good deal!”. However it looks like amazon does offer the free shipping. That’s always nice provided you can pick the bag up in the US to avoid the tarrifs. A “sale” is a way to get us to spend money. As long as we are spending, we are not saving. So no sale helps us save. It’s a delusion. It is best to buy quality when we need it and make it last. Have a happy one!!! I may be in the market for a new bag soon as the sunlight is clearly visible from the bottom of mine, and I will keep your keen eye for scams in mind as I’m searching! That is what gets me about these sort of sales. If a friend of mine bought that, I’d never hear about the $61 he paid, but only about the $139 he “saved.” Sometimes, people are too hung up on getting what they think is a good deal that they don’t shop around like you did. I saw a great news story about how retailers still make what they wanted even with a 30% discount. In other words, at 30% off, the retailer is still making a handsome profit. I’ve noticed in some of the ads, the deals were “Buy 1 Get 1 50% Off”. What a great way to get people to spend more. The advertisers have figured out how to market to the masses effectively, making them think they are getting a great deal when they really aren’t. Good work not falling for it…sometimes they make it so easy.